At New Age Dentistry, Dr. Sherry Steinmetz provides dental implant placement and restorations for patients with missing teeth. This innovative treatment is a permanent solution that enhances patients’ long-term jaw health and promotes comfortable dental function. Schedule your consultation for dental implants in San Ramon today! Missing teeth not only impact aesthetics but bone health as well. The jaw bone utilizes the roots of teeth for support, but when a whole tooth is missing, the bone begins to resorb. Bridges, dentures, and partials serve as the visible portions of teeth, but not their roots. Dental implant treatment replaces the entire tooth; implant posts are placed into the jaw, serving as a stable foundation for restorations. For patients missing one or both arches of teeth, traditional dentures are typically the recommended restoration. However, many patients find their dentures require adjustments over time to maintain a comfortable fit. When affixed by dental implants, dentures will not slide out of place or prevent you from chewing and speaking normally. Non-implant bridges replace one or several missing teeth. During this treatment, otherwise healthy teeth are altered and crowned to support the false tooth that sits above the gum tissue. Placing implant-retained bridges does not require the adjustment of neighboring teeth. 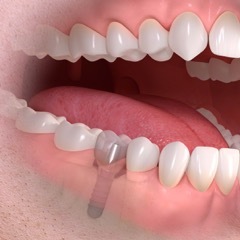 Dental implant treatment is tailored specifically to your goals. During the initial consultation, we describe the procedure and answer any questions you may have. Dr. Steinmetz will discuss with you the number of implant posts needed to support your new teeth. Our implant restorations are fabricated with high-quality materials that look and feel natural. Our San Ramon dental implants and restorations improve the function and beauty of patients’ smiles. For more information about implant services, contact New Age Dentistry today to schedule your appointment. We proudly serve patients from the surrounding communities of Danville, Alamo, and Walnut Creek.